Ash enjoyed his best season in 2018, making 22 appearances and finishing as the club’s season as the fifth highest try scorer with 11. He was rewarded with the number 5 shirt for the start of 2019 and a new contract that will keep him at the club until at least 2021. Ash is a former Oulton Raiders junior who came through the Rhinos Academy to make his debut in 2014 against London Broncos. He can play full-back, though mainly features as a winger and has proved to be a prolific try scorer for both the Rhinos and Featherstone, where he has played on dual registration, His first appearance of the 2015 season was against Wigan Warriors after he was called into the side for the injured Briscoe and made an instant impact with a try in the 26-14 win. He went on to make 20 appearances over the season and showed his natural scoring ability with 13 tries, which included two hat tricks against St Helens. 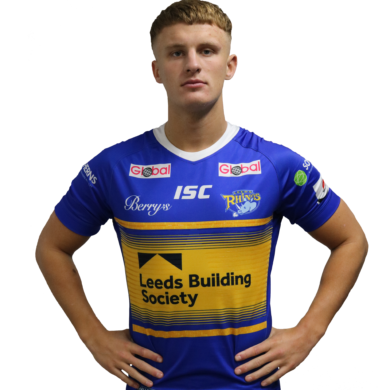 His performances over the season earned him the title of Yorkshire Evening Post Shooting Star which has previously been won by the likes of Rob Burrow, Liam Sutcliffe and Stevie Ward. During the 2016 season he continued his good form, coming in for cover from Tom Briscoe again, featuring in his first final against North Queensland Cowboys and scored two tries against St Helens in 2016, which brought his tally against Saints to an incredible eight in four games. Ash spent the 2017 season on dual registration with Featherstone Rovers and alongside his 12 appearances for the Rhinos he also made 7 starts 4 tries in the Championship. He played for the England Academy squad in 2014 against Australian High Schools and crossed for a try in the in at Leigh. The player he most admires in the game is his former Under-16s coach Carl Ablett and his favourite sportsperson is former Liverpool player Steven Gerrard although he supports Aston Villa. He likes listening to rap music and his favourite song is Lose Yourself by Eminem.